Ellas Retreat welcomes you to Greece, where you will practice Vipassana meditation, which is based on the four foundations of mindfulness. You will be offered the original practice from Wat Chom Tong in Thailand. In this retreat, you will train the mind to be aware of the present moment at all times, which allows you to cope with everyday difficulties. After the retreat you will have time to rest before you return home, where you can enjoy the beach and the surroundings. Savor every moment Greece has to offer! Note the teaching is based on donation. During the retreat, you will be accommodated at Ellas Retreat Paleros. There are 16 beds and three double rooms. There is also a small yoga space in the garden and a five-minute walk from the retreat center is a big yoga shala with an amazing view over the Ionian Sea and Lefkada Island. All the rooms are tastefully decorated and features an en-suite bathroom, air conditioning, a small refrigerator, and a hot plate for an emergency lunch or tea plus strong Wi-Fi. You may relax on the balcony or in the garden during your free time and feel completely at home. The main part of this retreat is the five days of Vipassana meditation practices. After the retreat there will be time to rest and enjoy the beach and the surroundings before you return home, there will still be silence in the retreat center as others will still be in retreat. You will receive individual guidance doing your whole stay by Martin Pack that has dedicated himself for many years to share this unique teaching that has been life-changing for a lot of yogis and meditators. Vipassana means to see clearly or beyond, to see the true nature of things as they really are. The practice is based on the four foundations of mindfulness, training the mind to be aware of the present moment at all times, allowing people to overcome everyday difficulties. The Vipassana meditation technique is being taught by teachers from Wat Chomtong. The technique is from the Mahasi Sayadaw tradition and has been developed by Ajarn Tong, the Abbott of Wat Chomtong near Chiang Mai. 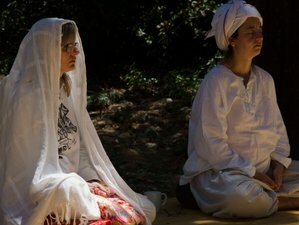 It is a practical technique, enabling you to practice after the retreat and incorporate mindfulness into your daily life. The practice consists of walking and sitting meditation. The course will get through different stages of knowledge within the practice. There are important benefits of the practice such as overcoming many personal, mental, and physical difficulties like relationships, work-related stress, letting go of attachments, and so on. Constant practice develops insights, allowing confidence, energy and effort, mindfulness, concentration, and wisdom to arise in order to help you and others overcome difficulties, enabling everyone to have more compassion. Vipassana meditation helps you in finding peace and happiness. Generally, you have perceptions of yourself and the world around you. Your perception is often distorted by different patterns of the mind like greed, anger, doubt, fear, and delusion. Mostly, you are not able to see these hindrances very clearly. When you practice mindfulness, you are witnessing the arising of these hindrances and instead of trying to avoid them or push them out of your mind, you see (acknowledge) them by making a mental note of them and then letting them go by bringing your attention back to the meditation practice. Therefore, you can begin to find peace and allow the insights to arise, showing you that all these experiences are transient (impermanent). The experience of Martin Pack, the teacher of the retreat, is seen especially during the report times (private daily talks between the teacher and the retreat participants), where he helps the students through their challenges with his compassion, characteristic humor, and deep understanding of the processes they are going through. The teaching is on donation in order to maintain the purity of the practice. The teaching is based on a donation. Ellas Retreat suggests a donation to the teacher between 90 and 200 EUR. Just like everyone, the teacher needs money for living like food, transport, and housing. Since 2002, Martin has practiced Vipassana meditation in the tradition of Ajan Tong. After a few years of participating in retreats in Thailand, he assisted the teachers in Wat Chomtong in Northern Thailand and also helped in assisting Ajarn Phra Ofer in Israel. On January 2009, he got certified to teach and to organize courses in Northern Thailand in a place called Pai. He has taught retreats in Thailand, Northern Italy, France, Austria, Greece, and England. This retreat will take place at Ellas Retreat Paleros, Greece. The retreat center is located in a small village at the Ionian Sea close to the island of Lefkada. It lies at the base of a spectacular rocky mountain and it is surrounded by sandy beaches. The village is not the main tourist attraction and this is that makes it so inviting. Ellas Retreat’s partner, FoodPath, a catering service for retreats, offers a healthy menu. A vegetarian breakfast and lunch will be served. There will be snacks in the evening and hot drinks the whole day as well. After the main retreat, you will have time for some beach and relaxation time. Please book your flight to arrive at Aktion National Airport (PVK) or Athens International Airport (ATH). Ellas Retreat can arrange a pick-up for 25 EUR. The nearest airport to Palairos is Aktion National Airport (PVK), which is 30 minutes from the retreat location. If you are visiting Greece from abroad, you will most likely arrive at Athens International Airport (ATH). Ellas Retreat can arrange a taxi pickup from Athens International Airport (ATH) for you at a cost of 80 EUR per person. From the airport, you can take the X93 city bus to the long distance bus terminal. From the bus terminal, take the bus to Lefkada. This route should take you to Vonitsa, a town that neighbors Palairos, just 19 kilometers away from where Ellas Retreat can pick you up for 10 EUR (one bus in the morning stops in Palairos). The fare is 34 EUR for the bus. The bus trip duration is about five hours, including the 20-minute break along the road. It is also possible to arrive via Thessaloniki and take a long distance bus to Lefkada where Ellas Retreat can pick you up. The deposit is fully refundable if the booking is cancelled up to 25 days before the arrival date. A yoga meditation center. Here you meet yourself. Kriya, Kundalini, Hatha, Tantra-Yoga, Tantra, Vipassana, Meditation, Mindfulness, Conscious Dance.